E4D-RT and developer, Timothy C. Johnson, received a prestigious R&D 100 Award November 3 at a ceremony near Washington, D.C.
A subsurface imaging software that combines supercomputing data analysis with real-time imaging and modeling capabilities was named one of the 100 most innovative scientific breakthroughs of the year. 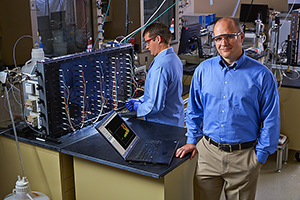 Real-time Four-Dimensional Subsurface Imaging Software—or E4D-RT—and its inventor, PNNL scientist Timothy C. Johnson, were recognized November 3 at the R&D 100 Awards ceremony near Washington, D.C. The software allows researchers to remotely look into the Earth’s subsurface in real time, allowing—for example—better understanding of contaminant migration in groundwater and soil that threatens the environment. 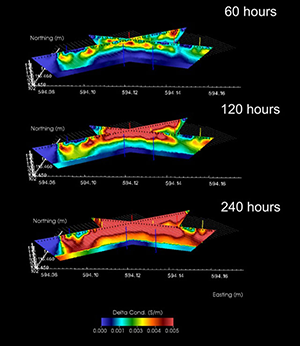 Through use of E4D-RT, "snapshots" of subsurface conditions are collected by measurements made at the surface or by electrodes inserted in boreholes that pass an electrical current through the material being studied and record how difficult it is for that electrical current to move through the material. The software accomplishes what no other existing commercial subsurface modeling software does. It combines supercomputers to analyze large-scale problems with virtually unlimited data processing; real-time imaging that allows investigators to understand subsurface processes at the time they are occurring; and the ability to model buried metallic infrastructure. E4D-RT, which was developed with funding from the Department of Energy’s (DOE’s) Office of Science and Office of Environmental Management, is available to users at no cost. E4D-RT allows users to remotely differentiate contaminants from clean soils and determine what is causing the contaminants to migrate underground. At the Hanford Site near Richland, WA, nuclear waste from World War II-based large-scale weapons production is contained in underground tanks. Over time, this waste leaked into the groundwater and soil, posing potential serious threat to the environment. Migration of this waste stream to the river—a very real concern to decision makers as well as the surrounding population—must be monitored and the processes controlling movement understood so cleanup may occur. While ERT technology has been used for remote subsurface 3D characterization and monitoring, the costs associated with cleanup and remediation call for more efficient solutions such as E4D-RT. Applying this software to cleanup efforts could save DOE hundreds of thousands of dollars over the life of Hanford’s tank waste project. For example, E4D-RT has been used at the Hanford Site to conduct the largest subsurface imaging ever conducted—at the B tank farm, the site of the underground tanks used to contain hazardous nuclear wastes created during large-scale plutonium production. The data set was massive—involving approximately 5,000 electrodes, 220,000 measurements, and an imaging computational model of about 3 million elements. The results are enabling site cleanup operators to locate and focus efforts on contaminated areas, reducing cleanup costs and environmental risks. E4D-RT has been extended beyond the Hanford Site for environmental cleanup. The Department of Defense has been using the software to study long-term effects of bioremediation—where subsurface bacteria are stimulated to help contaminants biodegrade more quickly. E4D-RT may also be used to track geothermal fracture networks in real-time. Most recently, DOE’s Subsurface Technology and Engineering Research, Development, and Demonstration Crosscut (SubTER) program used E4D-RT to improve the cost competitiveness of enhanced geothermal systems (EGS). According to DOE, more than 100 GW of clean, renewable energy could be generated using EGS—enough electricity to meet the nation’s power needs many times over. However, high upfront installation costs create a barrier to fast, widespread deployment of geothermal power plants. The initial cost for a field and power plant is around $2,500 per installed kW in the U.S., probably $3,000 to $5,000/kWe for a small (<1Mwe) power plant. Most of that cost comes from drilling the geothermal wells used to pull natural heat from the Earth’s core and bring it above ground, where it then can be turned into electricity. The first step to create an EGS is fracturing the rock beneath the Earth’s surface. Step two: connect the fracture network to geothermal wells. Geothermal wells are located in a fracture network’s path so geothermal fluid can be pumped underground and then flowed through the fractures. The rock heats the fluid and then the fluid flows to another well where it can be pumped above ground. PNNL and Sandia National Laboratory created a successful fracture network using Sandia’s explosive technology. As a co-principal investigator, PNNL used E4D-RT to image the fractures in real time. Using the data generated by E4D-RT, PNNL researchers were able to improve current models used to predict fracture networks. These models are important for geothermal energy investors, decision makers, and stakeholders because it reduces the uncertainty around where geothermal wells should be drilled. Installers won’t have to “guess” where to drill a geothermal well; they can use accurate models generated with the help of E4D-RT.